Today I bring a vegan pie recipe! 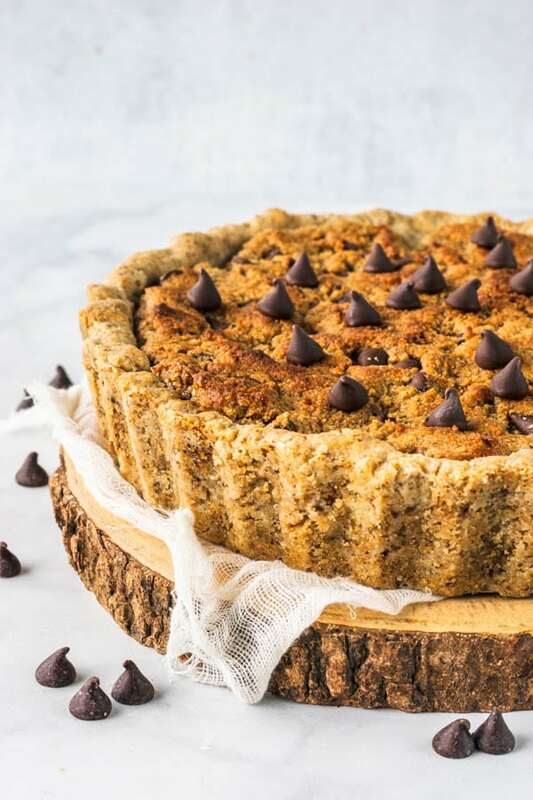 It’s a Chocolate Chip Cookie Vegan Pie. Words that come to mind: scrumptious, delicious, irresistible, rich, out of this world! This crust will seriously live in my heart forever. It’s my favorite vegan pie crust now! 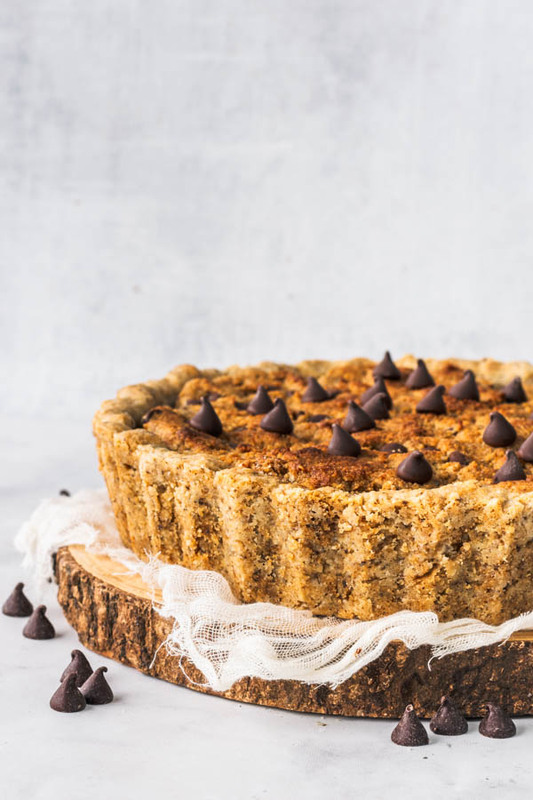 Not to mention that this pie isn’t only vegan, but it’s also paleo, gluten-free, refined sugar free. 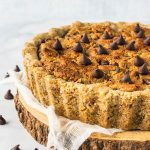 I have some other vegan pie desserts you can check out, such as my Pecan Brownie Vegan Pie, Orange Cranberry Vegan Pie, Vegan Peanut Butter tarts. 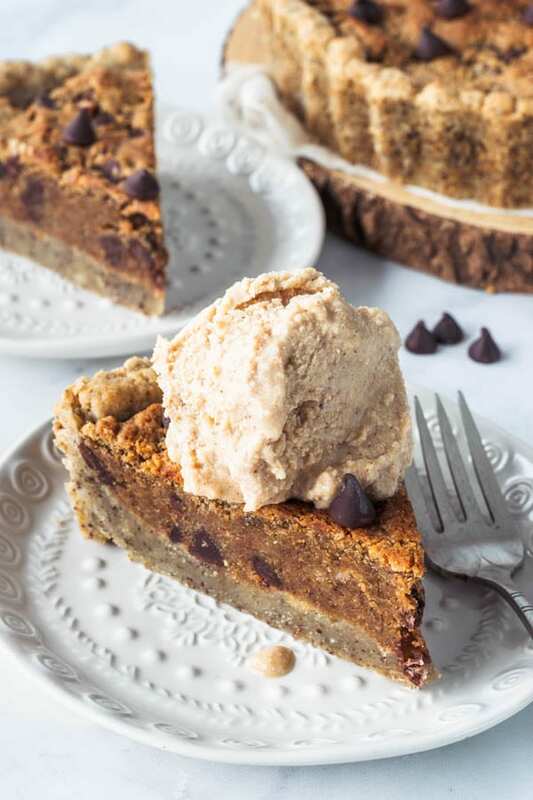 Making this Chocolate Chip Cookie Vegan Pie is super easy. It won’t take you long. 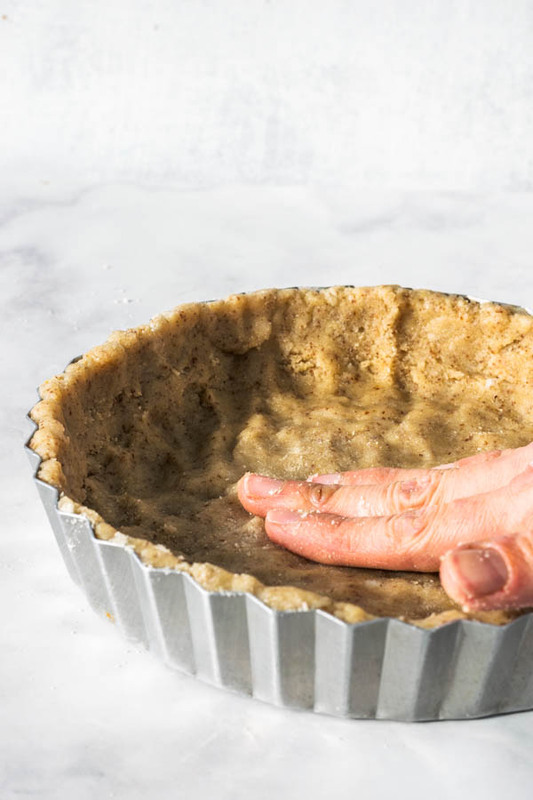 Make the crust and press it on the bottom of a pie plate. Bake the crust for 5-7 minutes until the edges are just set. Remove from the oven and shield the sides of the crust with some foil or pie shields to protect it from getting burned. Then bake the pie until the bottom looks browned and set. It helps to poke the bottom of the crust a bit to release air trapped in the crust. Remove the baked vegan crust out of the oven and let it cool down. Meanwhile prepare the filling. Once the crust has cooled down, spread the filling on the bottom. And bake it again. And after baked, you can simply stick some chocolate chips on top of the hot pie, so this way, the bottom of the chocolate chips will melt and stick to the top of the pie. I also made some vegan ice cream to join my pie. I followed this recipe by Joy Food Sunshine. The ice cream was pretty delicious and definitely worth it, specially over some warm pie. Needless to say this is another winner vegan dessert for me. It will go to the list of my favorites, for sure. 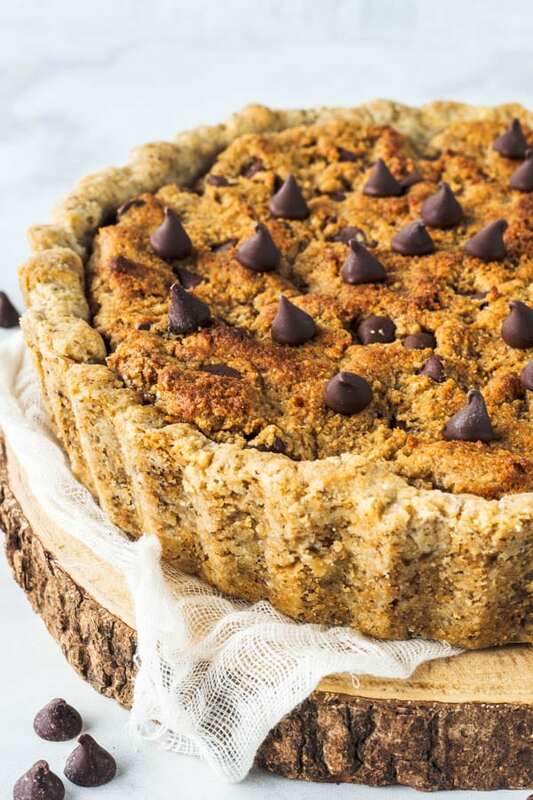 If you want to check out some more of my vegan pies and desserts, click here. 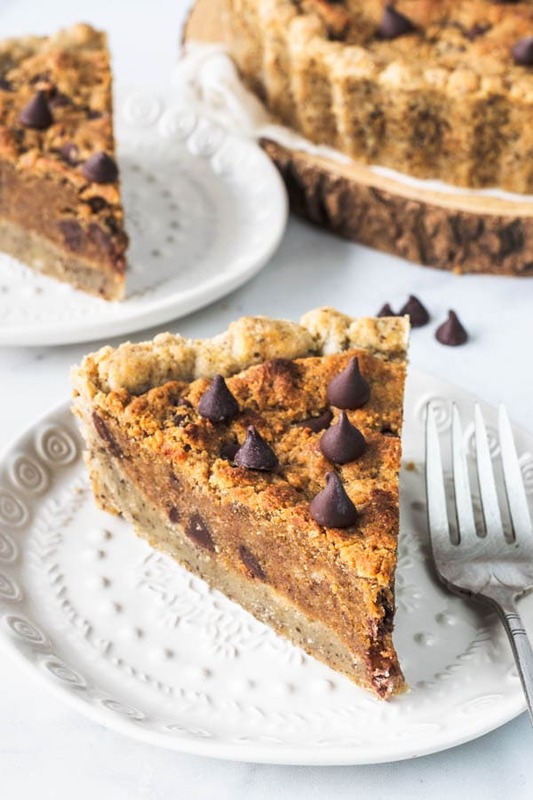 Chocolate Chip Cookie Pie is a scrumptious vegan dessert. It’s also paleo, gluten-free, refined sugar free, and absolutely delicious! Mix flax seeds with warm water. Set aside for 10 minutes to thicken. Add thickened flax seeds to the coconut oil and maple syrup mixture. Mix almond flour, baking soda and salt. Whisk to break up any large lumps of almond flour. Fold with the wet ingredients to combine. It will be a very wet dough. Press it to the bottom and up the sides of a tart pan or a pie plate, I used a 8” deep tart pan with a removable bottom. I used a bit of almond flour to help me press the dough down and not have it stick to my hands so much. Place crust in the freezer while you pre-heat the oven. Bake the crust for 5-7 minutes until the edges are just set. It helps to poke the bottom of the crust a bit to release air trapped in the crust. 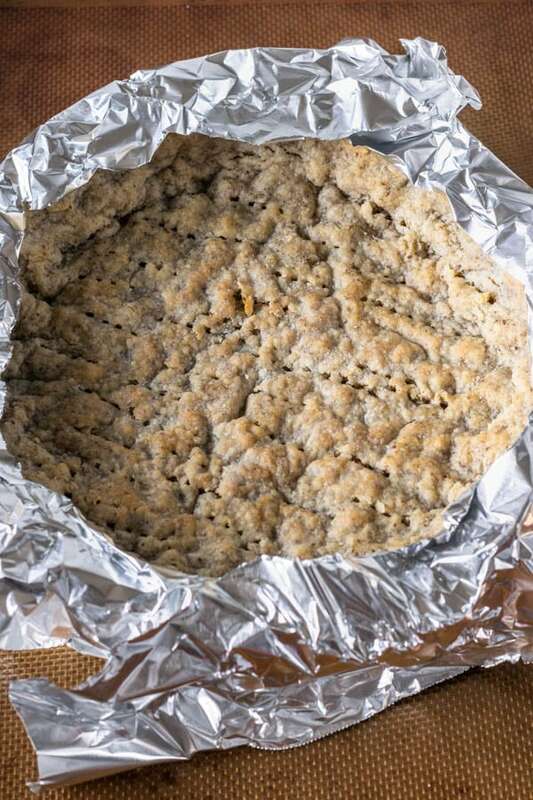 Remove from the oven and shield the sides of the crust with some foil or pie shields to protect it from getting burned, because they will start to brown quickly. It also helps if you bake your pie on a lower rack in your oven. Bake the crust for another 12-18 minutes, until the bottom of the pie crust looks slightly browned. Remove from the oven and let it cool before adding the filling. While the crust cools down, make the filling. Mix flax seeds with warm water. Set aside to let it thicken for 10 minutes. Mix coconut oil, almond butter, applesauce, and vanilla extract together. Add flax egg to the bowl. Combine the coconut flour, almond flour, coconut sugar, arrowroot powder, and baking powder together. Whisk ingredients together to break up large lumps of almond flour and coconut sugar. Add dry ingredients to wet ingredients. Mix to combine. Mix chocolate chips with 1 tablespoon of almond flour. 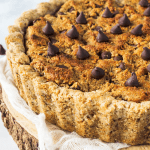 The almond flour will coat the chocolate chips and prevent them from sinking to the bottom of the tart once baked. Add chocolate chips to the dough and mix to combine. Spread filling over cooled baked crust. Bake at 350F for about 15 minutes, might take a bit longer. Once the top is browned and seems set, the pie is ready to be removed from the oven. 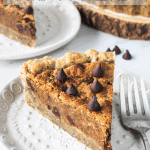 Place some chocolate chips on top of the pie when it comes out of the oven. The bottom of the chocolate chips will melt and stick to the top of the pie. Wait til it cools down to cut and serve. This pie can be kept at room temperature for a day or two, but I like to keep mine in the fridge. I heat it up slightly and serve it with vegan ice cream! Pie will keep well in the fridge for up to 5 days, well covered. This looks delicious! Are there any comments yet on this recipe? I’m thinking of making it for a baby shower, but would love to see comments or reviews! Hey Diane, thank you so much, I am very happy you like my pie! I hope you do make it! And please report back if you do! Thank you so much for your kind comment!! Have a great day! Camila, I’m making it now…can’t wait to try it! Quick question…is is possible to freeze it for a few days? I’m hoping to prepare as much as I can a few days before the shower. Hey there Diane! My answer would be yes. This is a recipe I would definitely attempt to freeze. However, as a disclaimer, I havent tried freezing it, so I can’t say with 100% certainty. But I don’t see why not. Just make sure you wrap it up really well, and let it thaw in the fridge overnight, it should be fine. I really hope it works for you, I think it’s worth the shot! Best of luck!!! Also, I have just thought of an alternative. 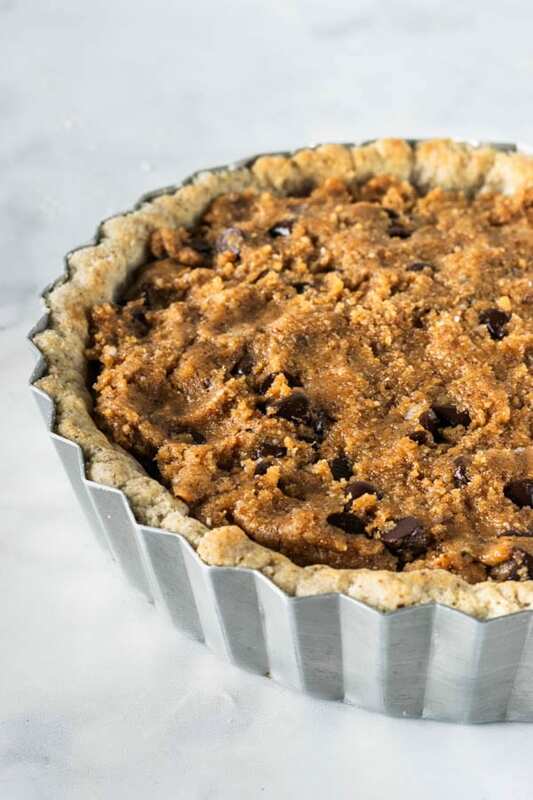 I think it might work well to follow the recipe up to the point of spreading the filling over the par-baked pie crust, and then freezing the whole pie without baking it (which means you would make the pie up to step 7 of the Chocolate Chip Cookie Filling Instructions). And then bake it straight from the freezer the day before the party. That might actually work better than freezing the baked pie. I think both ways could work well, but this way might be better to avoid the pie getting soggy when it thaws from the freezer if it’s already baked. I’ll try your ideas for the party! Thank you so much Diane!! I am so happy you like it. I also like to eat this pie right out of the refrigerator, it’s the perfect consistency for me. Thank you!! Have a great Sunday! !